Alan Elkin co-founded Active International in 1984. 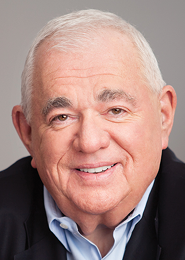 Elkin began his career at Kaiser Broadcasting which, under his direction as Senior Vice President of Sales, later became Field Communications and then a subsidiary of Katz Media Group. He’s received the Entrepreneur Of The Year Award by Ernst & Young and the British American Business Inc. Award in recognition of Active’s global accomplishments. Elkin believes that community involvement is as important as business leadership and through the company’s Active Cares program, contributions have been made to over 600 charities since 1997. With 35 years of experience, Active International (activeinternational.com) is a global financial solutions company that drives performance and improves business outcomes for leading brands. A data-driven company, with media as a core competency, Active operates a full service omnichannel media agency. In addition to media, Active brings to bear a broad portfolio of competencies such as Asset Disposition/Merchandise Sales, Real Estate, Retail Marketing, Travel and Hospitality, Freight & Logistics, and Lighting. Through the application of its core business model, Active is able to create financial benefits to serve its clients. Active International is based in New York and has offices in 15 countries. Will you discuss how Active has evolved during its 35 years and how you define the business today? Change is inevitable and today, more than before, change is accelerating every single year. Active is no longer the same company it used to be when we started. It is not that the culture or product is different, but the market is different. Every company has to be able to look at the marketplace and evolve, and that is what Active has been doing. It’s developing additional products that the market has never seen, such as XACTV, an unwired network that, in the old days, we would never have thought about selling space on it for cash; we would always sell it for an asset but, today, we do both. The marketplace demands we do both. Active can no longer remain as it used to be but, at the very core of this business, is trade. We trade for one asset or another and we look to gain leverage in everything we do. Is evaluating risk more challenging today with the speed of change and disruption taking place in all industries? I coined a phrase at Active called comfortable risk, which is what we need to take because in the marketplace today, there is risk wherever we turn. Technology is driving change and it’s based upon previous changes. Change accelerates very quickly, which means no one knows exactly where the market is going to end up. We have to take a risk, be bold, and look for where the market will go. what Active has been doing. How has change impacted Active? Change is dramatic. We live with change and those who have an issue with change end up being left behind. In business today, we need more early adapters to embrace change and understand that technological change is never going to stop. We work differently than we did 35 years ago. I’m online 24/7 – there is no shutdown. We run an international business and, somewhere, the sun is always shining for Active, so we’re out there 24/7 dealing with the changes in the marketplace. Just recently, I was on a videoconference between people in Mexico, England and the U.S. This is normal. Not long ago, that could have never happened. We have to change. If we don’t, we’ll perish. Do you characterize Active today as a financial solutions company, a technology company or a media company? I wish I could say it was either a financial solutions company, or a technology company, or a media company, but we’re more than just any of those. When we look at Active’s businesses, there is one common denominator in that it works with clients to improve their balance sheets. We work to do more for our clients in the fields of finance, media and technology. We have gone from being a classic corporate trade company to being much more than that today. Tomorrow, there will be new things on the horizon, because technology is changing so fast. We need to constantly be cognizant of those changes. How is Active positioned in the market? Because this company is able to embrace change, we are always ahead of the pack. That is where we belong – at the very front. We also don’t bother looking back. It’s not being arrogant, but we know that we need to reinvent ourselves whenever we think the time is right in the marketplace. We take our core business and surround it with different technology applications and bring a different view to the marketplace. This is how we see ourselves. Everything is tied to that one word: change. it works with clients to improve their balance sheets. We work to do more for our clients in the fields of finance, media and technology. How broad is Active’s client profile and are its solutions tailored for different size companies? Active works with a broad range of clients. We have a client that is a very large retail supermarket. They’re changing their business to become a media company and have found a space within their business model to be able to advertise in stores. They look at this as an adjustment to the marketplace, and an addition of something they have never done before. It’s impossible to know where a client will end up – they need to be able to adapt to the new marketplace in every possible way. CEOs can’t assume that their business is not at risk. When I wake up in the morning, I used to look at threats that were still far away. Today, I don’t. I look at threats that are already right in front of me. That is why we need to be able to change. As Active has grown in size and scale, does it get harder to stay entrepreneurial and nimble? It does. When we look beyond the Pacific and Atlantic Oceans, we’re dealing with different cultures. We have to find a way to communicate more effectively than we did in the past. If we embrace change, it enables more efficient communication – via videoconferencing for example. I did this in a very limited way a few years ago; I’m now doing it twice a day because the marketplace is changing, the company is changing, and we have to be able to communicate that change to people. When we do, we become a different kind of leader. Now, we’re educating people rather than just telling them what to do. It’s more difficult to tell people what to do today as opposed to educating them about what they need to do in the new marketplace. Are the services and solutions consistent and seamless around the world or are they tailored to local markets? The latter. We’re global, but when it comes to each market, the nuances in the countries are very different. Only miles apart, Germany and France are very different, for instance. Different cultures and laws apply, so we have to be local. is constantly changing out there. Will you discuss how critical it has been to attract talent in this changing environment? Different generations produce different people, and we have to be able to understand the differences within those generations and adjust our leadership. At Active, we have the smartest people because we hire differently than we did 35 years ago. We look more into the cognitive side of people and into their skill sets. We want to bring on intelligent people and those that have curious minds, because the marketplace is constantly changing out there. We have a different method of bringing people to Active, and that makes it easier to educate people. I would hope that Active is seen as a knowledge-based company. Knowledge is what leads us and drives us, as well as what allows us to become different as technology changes. Expanding the model as we have also attracts a particular set of people. Those who might otherwise work on Wall Street because they like working on complex models that are nontraditional are a good bet. We continue to attract very bright people. With Active’s growth and as change accelerates, has it been necessary for you to give up some control? I used to believe in constant control, but I can’t use that as a management technique any longer. The company is so wide that one has to be able to educate and coach people. This isn’t giving up control – it’s expanding the control and the nature of our business to as many people as possible. I have become an educator. No CEO can do everything today – the marketplace is so disruptive and technology is constantly changing. The answer is expanding that knowledge and educating people who are expected to be able to make the right decisions. Is it possible to forecast and look five years out for the business? No. The five-year plan from equity companies is gone – there is no such thing because no one knows what is going to happen in five years. The best we can do is two to three years out, but the time period gaining acceptance is 12 months. We used to lay a business plan out for five years and then we would narrow it down. Now, we’re changing the business plan as the market changes and as technology changes. We have to be able to adjust what we believed to be a fact and adapt to a different reality now. CEOs today adjust because they have no choice. As an entrepreneur who is always thinking about what is next, do you take time to reflect and celebrate the wins? That is an either/or question, and I don’t live in that world. I can do both. Today, one needs to have three or four contradictory views in their mind. I have passion for what I do because I enjoy what I do. There is difficulty in what I do – more so than there was several years ago. Yet again, it engages me, so I enjoy the changes. I embrace the changes and also apply the experience of my life to the new things that are happening. To me, this is a wonderful thing. When I have time to enjoy myself, I enjoy myself – I have a wonderful time. I like having a wonderful time.